My life has three stages. This card is from the second year of Stage Two, 1976, and it oozes comforting sameness from every pore. He is the same height and weight, 6’2″ and 175 pounds, as he was the year before; he was born in Pittsfield, Massachusetts, and lives in Pittsfield, Massachusetts; he is an Oriole and has always been an Oriole, even before I was born; his batting averages for the three most recent seasons are .226, .225, and .226; and the highlight note underneath his statistics–“Mark hit a Homer in 1969 AL Playoffs”–is just a shorter version of the same highlight note at the bottom of his card for the previous year (“Mark hit a Homer in 1st A.L. Playoff game ever, for O’s vs. Twins in 1969.”). Stage Two seemed as if it would last forever. I guess I knew on some level I’d get older. I knew, even if I didn’t fully believe it, that eventually I’d be too old to play little league baseball. I vaguely understood that there would come a day when my baseball cards would be a collection of artifacts gathered in the past rather than a living, breathing community that was growing in the present. I even had a hazy idea of adulthood (in my mind it meant living in a house and having everything figured out; I estimated that by age 30 I’d have the pain of life banished). I knew all these things, yet I also never really believed that it would end. How could there be a world without Mark Belanger? Very near the beginning of Stage Three, I took my first foreign language class, 9th grade French. The teacher was new to the school, and his name was Cormier. He was of French-Canadian descent but grew up in Western Massachusetts, where many French-Canadians had migrated in the days of yore to labor in textile mills. I don’t know Mark Belanger’s heritage, but his last name (was it once pronounced “Behlanjay”?) and his Western Massachusetts birthplace suggest that he and Cormier had similar backgrounds. The twosome also shared a slightly haunted, nervous demeanor. In Mark Belanger’s case this seemed to be the price paid for such enduring competence and steadiness and sanity, the 9-time Gold Glove shortstop unblinkingly scanning the horizon for the bad hops of life, the high-strung chain-smoking sentinel of my childhood. On the other hand, Cormier’s jittery mannerisms turned out to be the trebly upper register of a year-long symphony of chaos. We never learned any French. Cormier spent each day giving us detentions, allowing us to dare Randy Bradley to eat wads of paper, and telling us about his life. Most of his stories concerned his immediate past–he had until that year been an IRS agent and had just fled Washington, D.C., because he was convinced the angry recipient of an audit was trying to detonate his house with explosives–or his present-day battle with the state of Vermont to prevent the completion of a mental hospital under construction across the street from his new house. Cormier believed he was beset on all sides by wackos. He probably thought we were wackos, too, judging by the way he reacted whenever we turned our attention away from his monologues to talk amongst ourselves. He stopped rambling and fixed whoever was talking with a squinty malevolent stare. His finger would come up and point in the manner of an Invasion of the Body Snatchers pod person identifying someone who had yet to be replaced by an alien facsimile. “2:30,” he’d say, naming the time he expected you to show up for your detention. Sometimes class was just a long series of 2:30s flung at us by Cormier. As far as I know, nobody ever paid any attention to any of it. I know I never showed up for one of his detentions. I’d never blatantly disobeyed that kind of order before from an authority figure, but the thought of being alone in a room with the guy in an otherwise emptied building was enough to push me into disobedience. The next year, there was no sign of Cormier. I was in a class with Cormier veterans when a new French teacher came into the room, strange language coming out of her. We just sat there looking at her blankly. She spoke her gibberish more and more slowly, becoming increasingly exasperated at the lack of response. Finally she gave up. “Isn’t this French II?” she asked, in English. I wasn’t among the few students who nodded. I wasn’t really sure of anything anymore. Another Belanger trait, at least in personal experience, was a habit of showing up maddeningly frequently in packs of baseball cards. And not just one season — year after year, I’d rack up 4, 6, 9 Belanger cards, my frustration made more extreme by the knowledge that I’d never be able to trade a Belanger for so much as a “future stars” or team-manager card. Getting a Belanger in your pack of baseball cards was like opening your lunchbox to find a mealy-fleshed apple and overmayo’d tunafish sandwich in your lunchbox. In other words, the lunch you’d eaten with numbing, but someone comforting, frequency for years. 2. I still hope that a painfree existence is on the horizon, and 30 seems like an appropriate target to shoot for. Surely with personal assistant or a day planner, I can get a better grip on life. Note to self: get a day planner. Note to self: put notes to self in new day planner. 3. Mark Belanger was huge in Baltimore. With Belanger at shortstop the Orioles always had stability in the infield. A lousy hitter he was, but because he was so great at playing shortstop and so beloved to his teamates, fans and the Baltimore Orioles organization it didn’t matter that he couldn’t hit. 4. 3 : Thanks for chiming in, Marty. I always thought Belanger epitomized the quiet excellence of those O’s teams. Nice to hear that the O’s fans adored him. 5. I enjoyed the Earl Weaver scheme of batting him 9th so that he could play the field through possibly three innings until his spot in the order came up. Then he would be pinch hit for by a lefty (Terry Crowley?!?! )and replaced by DeChinchis as we used to call him. This is the kind of thinking that impressed me as an 11 year old and made me think the world of Earl. Thanks Earl – your my hero and a key to “burning the box” thinking. The antithesis of the Zimmer school of thought. And I mean that man. 7. 6 : Hey Manda, I believe you. Thanks a lot for adding some thoughts about the nice man who the rest of us only knew from far away. 8. We go on baseball trips every year for a week at a time. One of the other guys is from Pittsfield and we always stay a night at this parents’ house. It happens to be around the corner from where Mark Belanger grew up. We always drive by to look at the house. We all loved Mark Belanger as a player. There was a little of all of us in him. Belanger is thought of a little hitter, but it was actually him that changed the shortstop position to be ok to be tall. Probably he, as much as anyone else made the Orioles what they were for so long. Though he was a slick fielder in the mode of yesteryear’s Wallace and Maranville, like Ozzie, he did have a year or two where he got his average up a little. This is why he finally made it as an update into my all-time greatest league. He bats ninth, but wins games. The fact the Orioles stuck with him for so long verifies this! Let me be the first, and probably last, to suggest he should be given consideration for the Hall of Fame. Because he was not short, he was expected to have more power than he did, but in future generations will come a realization that he had one of top-level ranges of all time. Other no-hit, great range shortstops are voted in quickly, shortstops (including Ripken) who didn’t produce near as many championships. Belanger must have looked back on ’69 when he hit .287 like the rest of baseball looks at Williams .406 in ’41. lol…how did he manage .287 in ’69? 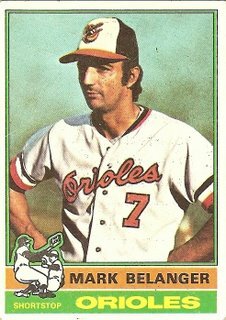 I had him on one of my mid 70s orioles teams…. I alwasy liked that card…he looks confident and cool…knowing he will stop every ball coming his way…..looking closer at the card he seems very confident and unware there is some type of fire smoke approaching his way in the background….i guess i always thought they were faded/blurred trees….but what the hell is that? Maybe they used smoke signals back then to exchange signs….opposing team thinking…HA…no way can wiley cagey belanger steal our signs now!